To this day I remember my first pot of mussels. It was at Hopleaf Cafe in Chicago’s Andersonville neighborhood, an old favorite of mine when I lived in the city, which specializes in Belgian food and beer. I can’t even tell you how many times I ordered those delicious mussels, served with a side of perfect fries in a paper cone and garlicy mayo for dipping. And if you think that fries with mayo sounds gross, may I suggest that you hold fast to that opinion and never try them. Because it’s just about the tastiest combo you’ll ever try, and it will be better for your waistline never to discover this fact. But I digress, that first pot of mussels was a revelation and I was hooked. Since that day I have enjoyed many more mussels in many more restaurants. I have even tried variations with tomato sauces and even Dorie had us making mussels with chorizo. All tasty, but I always come back to the classic preparation. 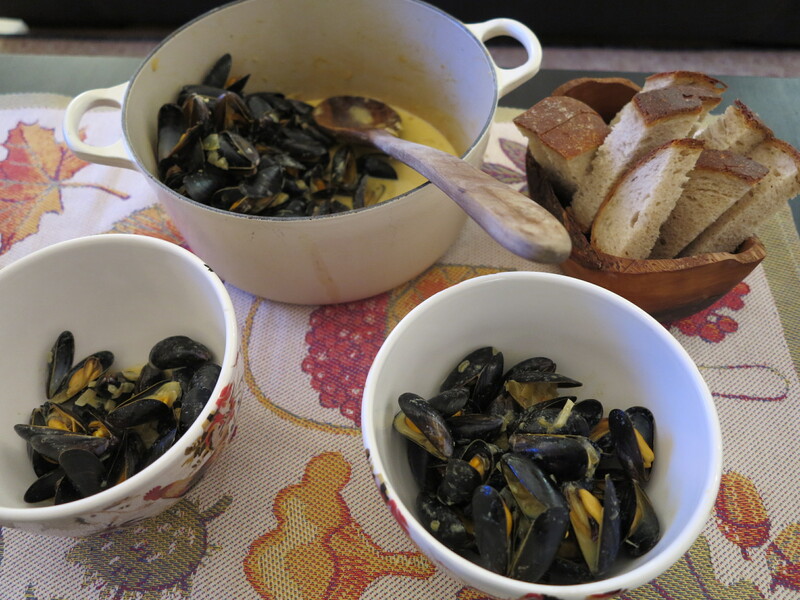 This week’s French Fridays with Dorie recipe, Curried Mussels, had me slicing more bread so that I could sop up every last drop of that tasty sauce. We picked a curry powder which had just enough heat to get your attention and we served it with a bottle of sekt, which we also used in the broth. So, so good. My husband and I both agreed that it was our hands down favorite mussel recipe from Around My French Table. We will make it again! This entry was posted in french fridays with dorie and tagged Around my French Table, shellfish. Bookmark the permalink. I agree with you on this one – the sauce was marvellous. I had my first mussels in Belgium and have a photo of me wearing a big bib taken on the occasion. I may have to make this one up after all—maybe when Bill is out of town! I am pretty sure this was Mr Neil’s fave iteration from the book so far too! This was a fabulous dish! I did switch out the curry for paprika…my hubby doesn’t do curry, but we loved it! The sauce was amazing! Love your photo of the pot and empty shells! I also sliced extra bread! Happy Friday Rose! Looks great, Rose! I agree re the mayo with the fries, but I actually don’t like store-bought mayo. I didn’t start liking it until I made my own. I don’t know why…probably flavor and texture due to the process and the oils used in large-scale production. I digress, this was a wonderful dish and I’m so glad you all enjoyed it too! Our first experience with mussels was in Belgium where Jim got quite ill.
Mussels and Brussels always come to my mind too, but I grew up eating mussels, always with red sauce, very garlicky over pasta. Glad to see another mussel lover. I love fries and mayo (I hate ketchup). And, I love mussels, too. These were especially good. I’d never heard of sekt before, but now I have. I’ll have to see if they sell it here. I love bubbles. Loved this recipe too! I think the Sekt would be perfect for this, I’ll have to remember it next time we make this. My thoughts exactly. No matter how I’ve had mussels in the past (and, like you, I order them everywhere I can), I always return to the classic preparation. BUT I loved this recipe and the curry idea. I even doubled the “kick”. Don’t repeat this to anyone but I think Belgium holds it own with the French regarding delicious cuisine. I remember trying frites with garlicky mayo for the first time in Bruge and thinking I wouldn’t like it. Just being a good sport. Well, how wrong was I. And, you’re also correct about the waistline problem. I’ve had mussels and mussels and more mussels since coming to California last week – just because of the FFWD recipes and leftovers. Although I’ll take a break from them for a week or two, I still just love those little darlings. My first bowl of Moules and frites was in London, the the 2nd in Bruges. Loved them at the time, unfortunately now I never touch them. I am happy to hear you have found a new favorite in this recipe. Totally agree that this recipe is awesome! I used it twice more after the mussels – beef and fish! Dear Rose, wasn´t this a great recipe – I think the idea of adding a good bottle of Sekt to the sauce instead of the white wine is an absolutely fabulous idea! Love your presentation of the mussels in that wonderful large white Dutch oven – and all that delicious bread to mop up all that great sauce! This is a recipe that I will make many times again, we loved it too! Glad that you found a favorite recipe and that your husband enjoyed it too. Have a great week. I remember the first time I really learned to like mussels. A friend and I took a day trip to Whidbey Island in Washington State, and after a lovely hike on the beach we stopped at a small pub-like restaurant on the water that served the freshest mussels! This recipe was my hands down favorite mussels recipe from the book too.